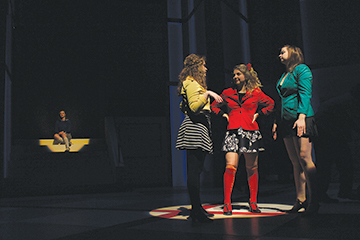 (From left to right) Natalie Krivokuca, as Veronica Sawyer, and the three Heathers played by Laura Schulze, Brie Howard and Alyssa Durbin are onstage in a technical rehearsal in the Lindenwood Theater only a week before “Heathers: The Musical” opens. The Lindenwood Theater will turn into a time machine that takes the audience back to the ’80s and high school as the dark comedy “Heathers: The Musical” flashes on the stage this Thursday. “Heathers: The Musical” is based on a 1988 movie of the same name that starred Winona Ryder and Christian Slater. It tells a story of 17-year-old Veronica Sawyer who goes to Westerberg High School, which is ruled by a shoulder-padded, scrunchie-wearing trio of girls called the Heathers. However, director Nick Kelly said the story is not just about Sawyer’s journey wanting to be popular, but about everyone in the school trying to find where they belong. Alyssa Durbin, Brie Howard and Laura Schulze act as the three Heathers during a dress rehearsal. Besides acting the lead, Krivokuca is also the co-choreographer for the show. She said Sawyer is an intelligent girl who just does not fit in and looks up to the popular Heathers wanting to be like them. Brie Howard, a sophomore in musical theater, is one of them, the leader of the trio, Heather Chandler. Howard said Heather Chandler is the girl that “you love to hate in high school,” who knows everything about everyone, but barely anyone knows anything about her. She is the girl who “orchestrates” the school. Kelly said her character’s costume uses the color red to symbolize her power. Kelly said, similarly to Chandler, color plays a major part in the show through costumes illustrating the other two Heathers and J.D., the new rebel guy in the school who infatuates Sawyer. Natalie Krivokuca takes center stage during a dress rehearsal for “Heathers: The Musical”. Kelly and Howard both think what makes “Heathers” unique is that it gives an opportunity for young actors to perform in roles that are so close to their age and in an environment that is familiar to them. Also, it is still topical today even though it relates back to the ’80s. 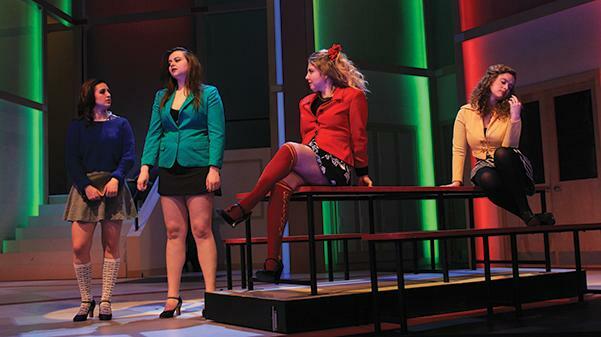 “Heathers: The Musical” starts at 7:30 p.m. and runs Feb. 23 – 25 in the Lindenwood Theater.